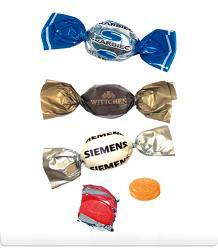 We have a large collection of Customised sweets in our corporate sweets and confectionery department. View the full rage of Customised Sweets here. So enjoy everything from jelly beans to mint cards, personalised chocolate bars to chocolate coins. To find out more about our customised sweets click here and fill in the contact form and we'll get straight back to you. Other promotional and personalised items besides our customised sweets click here. Further details about our corporate sweets and personalised confectionery here.